Oh Askinosie, how do I love thee? Let me count the ways: San Jose del Tambo, Hazelnut Spread, Davao from the Phillipines, Cortes Honduras, Peppermint Bark, Fleur de Sel, Soconusco, Mexico and now you give all of us yet another reason to love you – the San Jose del Tambo Nibble bar with nibs. The area of Ecuador that this chocolate comes from is producing more and more chocolate of late. Shawn Askinosie always pays above fair trade market prices for the beans, as well as 10% of net profits from the chocolate that was made with beans grown on their farms. San Jose Del Tambo is situated in the foothills of the Andes Mountains. At Del Tambo, the hills rise sharply until the tops are obscured by low-hanging clouds. The Rio de San Miguela, a fast-flowing river, along with just the right climate provides the land for some of the best cocoa in the world. The chocolate is more of a chewing than a melting bar but with the smooth conch that still preserves my beloved red fruits while lending a nutty earthiness with the nibs, it is a delightful and amazing chocolate bar. 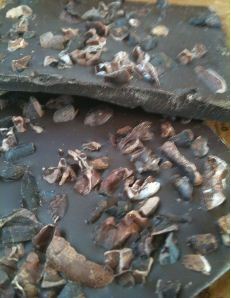 The smooth chocolate is contrasted by the crunchy nibs which explode with flavour on your palette as you chew them. They are not at all bitter and are actually delightfully flavoured and since they are from the same bean, they add a further level of complexity. The notes of red fruits aren’t as pronounced as the nibs bring the earthier nutty notes more to the fore. The finish is surprisingly clean with little taste lingering after chewing through a piece as slowly as my excitement would allow me to do, meaning I was happy to either try more or a new bar. There is only a mild acidity to this bar it seems but there is an acidity so as it hits your cheeks and side of your tongue be ready for the mouth-watering delightfulness of it. These bars are not just award-winning, extremely high quality chocolate in their own right but the relationship Shawn has with the farmers he works with is also something to be proud of. He not only works directly with farmers but also does social good in the Phillipines with the kids in the areas he buys chocolate from. 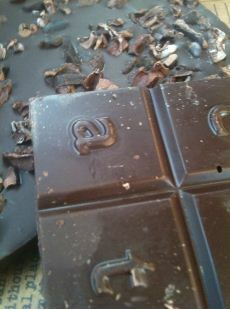 Buy this chocolate because it tastes amazing, buy extra because it helps Askinosie do more good.